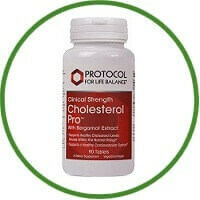 Cholesterol Pro is a dietary supplement that supports healthy cholesterol levels. It contains two ingredients that have been scientifically tested for their effects on serum lipid levels already within normal range. Bergamonte is a standardized polyphenolic extract derived from Bergamot (Citrus bergamia) which has a unique composition and high content of citrus bioflavonoid constituents. Bergamonte has been shown in clinical studies to help to support serum cholesterol levels and may also encourage proper blood sugar levels already within normal range. CardioAid is a proprietary plant sterol combination of Beta-Sitosterol, Campesterol and Stigmasterol, has also been demonstrated to support healthy cholesterol levels and overall cardiac health.